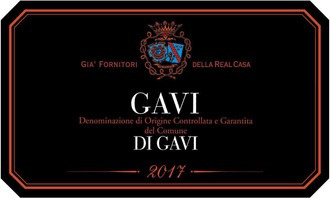 Wine Marchesi di Barolo Gavi di Gavi Black Label 2017 - Royal Wine Merchants - Happy to Offer! The Marchesi di Barolo Estate encompasses approximately 110ha of vineyards in the Langhe, some of the finest in Piedmont. The cellars are located in the village of Barolo, overlooking the magnificent village landmark, the Renaissance castle of the Marchesi Falletti di Barolo. The grapes, harvested by hand, are soft pressed and fermented at low temperatures in stainless steel tanks. To bring out the characteristics of the wine, vinification is carried out at Rovereto di Gavi. In that way, the grapes can be crushed immediately after harvesting. To preserve the bright color, fresh and fragrant smells there is no aging in wood barrels Tenuous straw-yellow color with greenish reflections. An intense and fine odor with persistent fruity and flowery scents similar to those of Golden apples and green almonds as well as a clean aroma of chamomile flowers. The flavor is full-bodied and remarkably sapid, balanced, harmonious and persistent. A classic wines for fish, seafood and appetizers in general. Because of its sturdy structure, the wine can also accompany delicate introductory dishes.